A robotic engineer, father and husband, Piolo thinks that the current government needs a change. Happened in the future, (no this is not a sci fi comic book) the komiks somewhat connected with the past Philippine history of Edsa revolution 1. In Piolo's search for the country's freedom, he sacrified his job and his family and worked secretly with the rebels. The conflicts were presented with such emotions that would stir up every Filipinos. You cannot help but be moved by its excellent story telling. The rough art of Mel was just perfect for how the story needs to be visualized. Ah, you need to read it yourself. 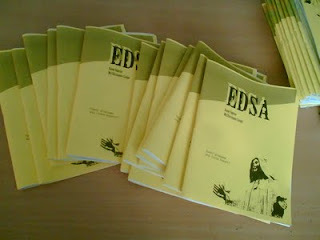 Be sure to get a copy this coming Oct. Komikon!